For the third year, hundreds of riders will take to the streets and trails of Central Florida, riding 28 miles through 5 cities. UPDATE: as of 4/22, our escorted ride is at capacity. However, the course is fully marked this year, and riders are welcome to start at any of our 5 cities and ride independently or in small groups. Register by 4/24 for a free t-shirt. NEW THIS YEAR: based on your feedback, we will have a registration table at each of our five cities: Winter Park, Orlando, Casselberry, Maitland and Eatonville. If you’re comfortable riding on your own or with a smaller group, you can start your ride at any location between 7:30 and 10 am. Just stop by the registration table to get your t-shirt and map, then take off (route will be marked). Please join us afterward at Mead Garden around 1 pm. for post-ride refreshments. We will still have a large group ride, escorted by ride ambassadors and police at major crossings. That ride will take off from Mead Garden, Winter Park at 8 am. Who: Riders of any age, experience or ability level. Participants are people wanting to learn where they can comfortably ride their bikes throughout Central Florida. What: The 3rd annual Bike 5 Cities Ride is a 28-mile regional bike-ride on trails and bike-friendly, comfortable roads. The goal is to show you some comfortable places to ride bikes. When and where: Saturday, May 4, 2019 – New this year, you can start your Bike 5 Cities ride at any of our 5 cities and follow the marked course on your own.You can check in at any of our 5 cities between 7:30 and 10 am to pick up registration materials and your t-shirt. The group ride will consist of about 200 cyclists. The group will take off from Mead Garden in Winter Park around 8 am. There will be experienced cyclists serving as Ride Ambassadors to assist newer or less experienced riders. The group ride will also have police escorts at certain intersections. See a map of the full route. Aid stations will be located at each city. Join our group of hundreds of riders, go on your own, or go with a smaller group of friends and family. We want you to make the Bike 5 Cities ride your own. We’ll have 5 staffed rest stops along the 28-mile route– one in each of the 5 cities: Winter Park, Orlando, Casselberry, Maitland and Eatonville. Mechanical support, food and drinks provided. Join us at Mead Garden after the ride for refreshments and fun. Mead Botanical Garden is a 48-acre urban oasis located in the heart of beautiful Winter Park. The park has a community garden, an amphitheater, quiet nature trails and a bicycle trail that wraps around the northern border and connects to the Orlando Urban Trail. Our group ride will start and finish here. Come and enjoy Orlando’s Lake Druid urban mountain bike park with a pump track, junior pump track and single-track trail. City staff will welcome the Bike 5 Cities riders. Don’t forget, Lake Druid Park also features a fenced dog run and a community garden. If you’re starting in Winter Park, this will be Mile 4 of your ride. Ride a family-friendly route partially along the Casselberry Greenway Trail. Connect to Carriage Hill Drive and then, bike your way back to Wirz Park via Zinnia and Wilshire. The 29-acre park has a pool, playground, basketball court and picnic area. Casselberry is Mile 16 of the 28-mile ride. Maitland offers residents a suburban feel, just a few miles away from downtown Orlando. Visitors say Maitland Community park is a great place to go experience nature and try out their trails. The Maitland Community Park sits at the end of Mile 20 on your ride. The Town of Eatonville claims Central Florida’s most comfortable communities to ride a bicycle. The setting for one of the most important works of the Harlem Renaissance, Eatonville is no longer a backwoods town in a rural area– but a thriving part of metropolitan Orlando. Visit Florida calls it a “cultural gem.” Eatonville is halfway through Mile 24, almost home! Have Questions about ride length, where to start, etc.? We need Ride Leaders to roll ahead of the group. We need Ride Marshalls to coach and guide the paceline. We need other volunteers for the day of the event. The safety of our participants and volunteers is our most important concern, and if any threatening weather conditions are present the day of the event (tornado warnings or watches, thunderstorms, heavy rains or a hurricane), the event may be delayed or canceled. 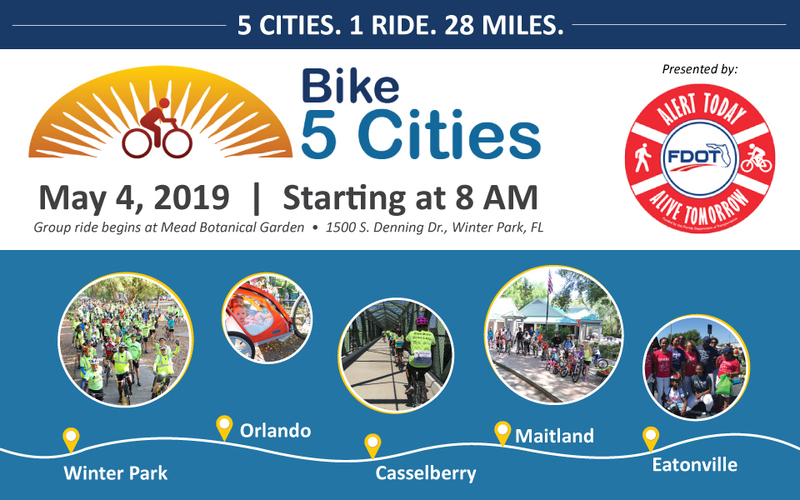 Bike 5 Cities started as a simple idea to create a bike-friendly map through the Orlando metro area to show people where they can ride comfortably. As the ride’s popularity skyrocketed, it has turned out to be an advocacy asset in the movement to push for more bike-friendly infrastructure. Hear from Bike 5 Cities architect, Lisa Portelli.